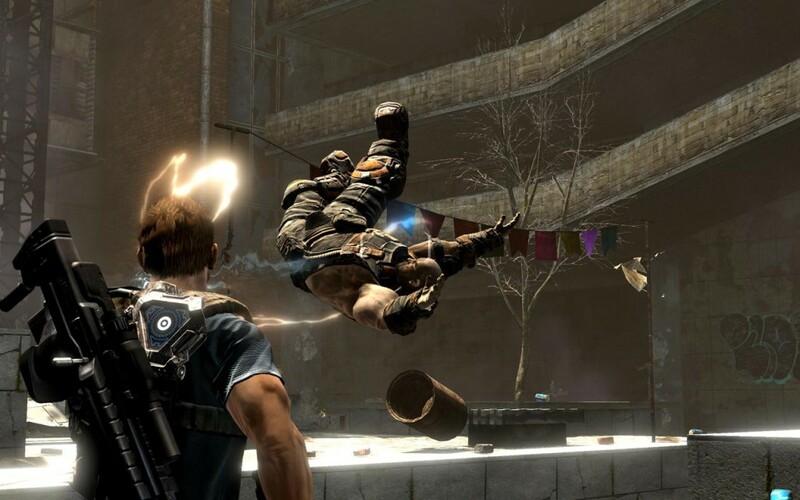 Inversion is a third person shooter released by Namco for Xbox 360, PS3 and PC. A game which at first sight looks like a trip down memory lane, meaning a lot of the gameplay parts we have seen in other games. Will the game prove to be a drag or will it be an unexpected hit? You play as the police officer Davis who is about to have a really, really bad day in Vanguard city. Together with your partner Leo, Davis stumbles upon what first seems like a ‘normal shoot-out’ in the middle of town but he seems to be very wrong. The battle ends with Davis and Leo getting captured, at least after Davis sees his wife getting killed in the action and his daughter run away. Ofcourse when Davis is held in captivity this is the only thing he can think of. Saving his daugher and give his own dose of payback on the scum that killed his wife. Namely the Lutadores, who seem to come from under the ground to enslave//kill all the humans on ‘earth’. (Monsterlike human beings that come from under the ground… we’ve seen that somewhere before haven’t we?) While managing to escape your dire situation you will unveil that the Lutadores are also fighting some kind of robot-race which tends to be useful from time to time. What first seems like a story with a lot of resemblances to other games will get an unexpected twist somewhere past the halfway mark in the game. (I’m not spoiling anything) Which proved the originality of the designers and will surely help to finish the game to see how the rest of the story goes. As usual I’m keeping some details to myself not to ruin your overall gaming experience. At the end of the game you will notice that you will have some questions about the story that are still unsolved, which can be a good or a bad thing. Inversion also tends to recycle a lot of the enemy characters, meaning the first half of the game you will constantly see the same two lutadores attacking you. The second half two other enemy models get added to the mix. Ok, I admit this happens in a lot of games but for me it’s not normal to kill the same type of boss five times in around two hours. The overall sound experience of the game is a pleasant one. Inversion offers us a decent soundtrack and voice acting that isn’t all too shabby. During action scenes you will probably not notice that much music going on but it’s there, subtle but decent. Simply put an OK job when it comes to sound. After finishing the game, I can simple write: Gears of War with a gravitational twist but let’s elaborate a bit. 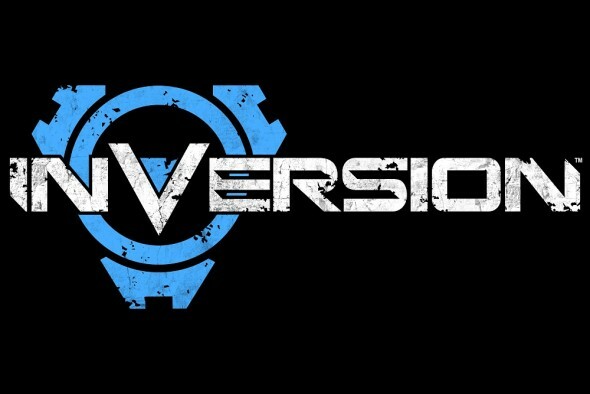 Inversion is a third person shooter which works with a cover system. You will need to hide and play ‘tactical’ to get through combat scenes. Like in most games this generation your weapon supply will be limited, namely you will always be limited to carrying two weapons and grenades. This means at certain times you will have to discard one weapon to switch it with another one. When running low on ammo on a certain weapon it might be best to consider switching it, because in some parts of the game it will be hard to find ammo. (which contributes to the difficulty, good job! And yes I realise some people will think I’m a total douche for saying this is a good thing.) At the beginning of the game your weapon arsenal is fairly limited to a machine gun and a shotgun and this will pretty much stay this way until you’re halfway through the game. At this point you will come across rocket launchers, RPGs, electric rifles…. Overall you will not see that many different weapons, which isn’t a bad thing in my opinion, too much weapon diversity in a game like this will only offer situations where you constantly have to switch weapons and never learning to use one properly. Now the ‘twist’ in this game is that you will able to perform actions that have an influence to the gravity around you. 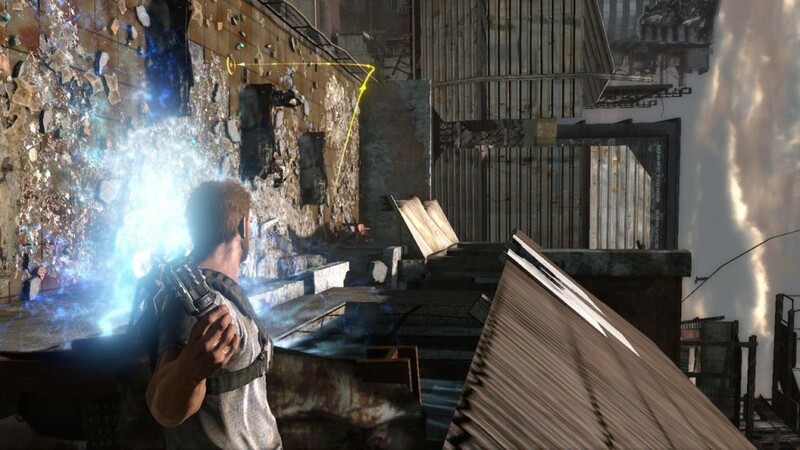 Pretty much at the beginning of the game your character will receive a special device that can perform these kind of actions. You will be able to make items or enemies float, which you can pull to yourself to toss them further away or throw stuff at enemies. The second part of your device is making things heavy, resulting in dropping down items on your foes or pinning them to the ground. This mode also offers you to give yourself some extra protection with a forcefield around your character. The second part of the gravity aspect is that you’ll come across zero-gravity zones or that you are able to switch between gravity planes. Zero-gravity zones speak for themselves, you will float around clinging from object to object trying to get through different areas. (Fighting in these zones will take some time getting used to) Switching between gravity planes will happen when Davis walks through a blueish portal on the ground switching the gravity from for example the ground to the ceiling, by wich you will walk on the ceiling and will try to get through and area or battle that way. Inversion offers us with a co-op mode which is always a great attribution to a game like this. Sadly they don’t offer us the option of playing co-op split-screen. Personally I think a game like this is really enjoyable with a friend next to you. Note: During the single player game you will need to heal your partner from time to time aswell. Multiplayer has been included in Inversion, which is simply a nice gimmick in a game which revolves around the single player story. You might have some fun playing the multiplayer mode but probably not that long. Note: The overall gameplay length of the game will be around six to eight hours depending on how much you die.